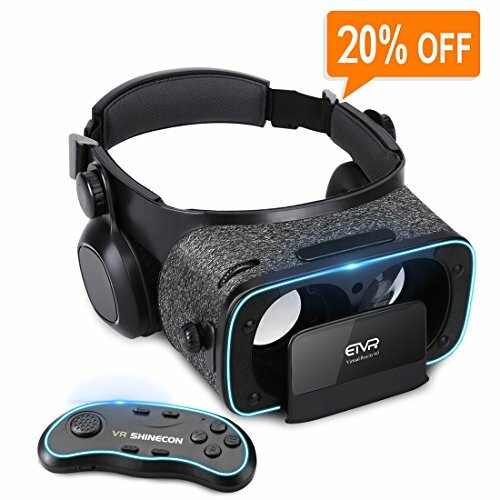 Whenever and wherever you want to play a game, take a virtual vacation or watch a movie in VR WORLD, all you need is your phone and this headset, here you go in 360° panorama viewing and gaming experience just at your sweet will. This VR adopts advanced technology, completely eliminates the feel of vertigo and provides you higher-resolution image. Wider horizon will beyond your imagination, upgraded lenses allow you to fully immerse yourself in a virtual reality world. There will be no dizziness to better protect your eyes. Adjustable Pupil Distance and Focal Distance make this VR perfectly fit for myopia or hyperopia users. Myopia under 600° and hyperopia within 200° are no need to wear the glasses when enjoying. Of course there is no limitation for you to wear your glasses. Also both kids and adults will soon find out the right place with the adjustable head strap. Skin-friendly sponge leather and anti-allergy lightweight materials aim at soft touch your ears and face gently. Deepened nasal bridge portion ensures comfortable wearing and keeps no light exposed. What Apps Can You Download? There are plenty of VR Apps. You can download apps from App store / Apple store / Google play store by your phones, such as Veer, Google Cardboard, or you can download more 3D videos from Youtube or Netflix. We pay much attention to both comfort and image after one year and a half of research - hope this product will be able to share with you the wonderful possibilities of VR WORLD! WHY SHOULD YOU CHOOSE US? - ▶After thousands of market research, we are the highest quality 3D VR for this price recognized by customers; ▶Widely compatible with almost iPhone & Android phones with screen size in 4.7-6.2 inch, such as iPhone 6/6s/7/7 plus/8/X; Samsung S5,S6,S6 edge,S7,S7 edge, Note 4,5; LG G3,G4,G5,G6,V10,V20; Nexus 5,6P etc. ▶Portable bluetooth remote controller, compatible with Android and iOS systems. It can be used as gamepad, media control shutter, bluetooth selfie shutter. SO WHAT ARE YOU WAITING FOR? ▶Here are the best quality & most unique design products, you can use it to watch 3D movies on Video Player and play varieties of VR games; ▶30 days return policy without any reasons; 6 months warranty for same model replacement or refund due to product quality problems; 24 hours online after-sale service for best service & 100% satisfaction; ▶We are committed to give you a good using experience so its highly cost performance of it will impress you deeply.